Today marks the first completed week of my bike riding. The ride is starting to become a little less of an invasion to my system and I am actually enjoying my early morning cycle. It’s a good time to collect my thoughts and plan my day. I think it has been established that I am not much of I dieter. I don’t really believe in diets. Yes, I know they DO exist, what I mean is I don’t care for the results they get and the way dieting achieves these goals. If you dramatically decrease your food intake, true you’ll lose weight over time, but I find it leaves me cranky, unhappy and most of all hungry! Also, such a decrease in food intake cannot last forever and I find most people eventually gain the weight back. What I do instead, is make wiser and healthier choices. These choices usually contain less calories, fat and sugar anyway, so I am avoiding all of the “empty” calories that can pack on the extra pounds. I eat 5-6 times a day (three meals and three snacks) and drink lots (and lots) of water. 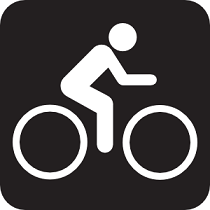 Without suffering through hunger all throughout my day, I rely on increased activity (in this case, biking) to burn away the excess pounds. So after my first week into my regime, I am happy to report that I have shed eight pounds. It may not have done much to change my waist size yet, but it has done wonders for my frame of mind, making it easier to stay the course! I must admit, I am already starting to feel better and have more energy too. Maintaining a healthier “lifestyle” will give us real results and will be a change that we can make and stick with. Another thing I don’t believe in is denying yourself the things that you truly love. So during the weekends, I will treat myself to the special foods that I may be craving but… in moderation. A slice of cake is a nice reward for eating well all week and will NOT cause you to gain any weight. Remember, in order to GAIN a pound, you would have to consume an additional 3,500 calories above and beyond what you needed to get through the day. That bounces back to that word “moderation” again. Healthier choices, moderation and smaller meals more often, is what works for me. It turns out there IS a science behind it too. With starvation diets, our bodies go into starvation mode. We are made to do so. Our body will metabolize at a much slower rate to “store” what we did eat. By eating smaller meals more often we “trick” our body into getting used to steadily burning what we are taking in. When you pair that with increased activity (preferably cardio) it will kick up your metabolism causing you to burn more calories. Burning more calories equals losing pounds. I know that eight pounds in a week is not the “norm” for most people. I have been blessed with a very good metabolism. That said, wouldn’t you be happy steadily losing 3lbs. a week, especially if you do it without ever being hungry? More than a soup, it’s almost a stew, this “stewp” is a hearty meal in a bowl! A small side salad and a crusty piece of bread is all that is needed to completely satisfy your family. Okay are you ready for this? This recipe couldn’t be any easier. You don’t even have to sauté the veggies or brown the chicken first! Prepare all of the fresh vegetables by cutting or dicing into size and set aside. Pour canned tomatoes into a large bowl and break apart by squishing them through your fingers (I leave them in pretty big pieces, as I enjoy the chunks of tomato in the soup along with the other veggies. Once all your ingredients are prepped, put everything (EXCEPT THE FROZEN VEGETABLES) into a large stock pot. Season with salt and pepper and bring to a boil. Once boiling, reduce heat and simmer until vegetables are cooked and barley is tender (about 45-minutes to an hour). After 25 minutes, remove chicken to a platter to cool. Once the chicken is cool enough to handle, tear apart (or shred) into bite size chunks and discard bones. When the soup is cooked, stir in the frozen vegetables and return the shredded chicken into the pot. If needed, heat until the frozen green beans are heated through. Test seasoning and make any adjustments. Remember to remove bay leaf before serving, as it could become a choking hazzard if accidently swallowed. Serve as is, or with a light sprinkle of parmesan cheese. The other day I went out for my daily bike ride, which I have started again after almost 3 years of being sediment (A whole other medical story of which I shall spare you the gruesome details). It was only day three and much to my chagrin, I found myself huffing and puffing more than expected. After all, the last time I was doing this, I was in peak condition. As I directed my bike into a cul-de-sac I noticed from one of the homes, a garage door began to open. Out stepped a handsome young fellow who was obviously about to walk his beautiful black lab. We caught each other’s eye and gave the obligatory nod of recognition. Then as my bike came close to the guy, I said, “Good morning!” Feeling like he had to be equally as courteous, the lad replied, “How are you?” Now we all know that, that is really far more of a rhetorical question and seldom receives much more than a “fine and you” as a reply, but something inside me decided to be frank, “Fifteen years past my prime and forty pounds overweight. How are you?” I answered. For a brief moment he was caught off guard, before he put it all together and began to belly laugh. As I peddled away I was glad that my meager attempt at humor had met with the young man’s approval. Still I couldn’t help but think to myself that the simple humor of the statement was the truth that it carried. I am fifteen years past my prime. There’s no denying it, my best days are behind me and that’s okay with me. I had my day in the sun. We can’t stop the clock from ticking and I am well aware that I am getting older. Being forty pounds overweight however was a very different story. That is due to a conscience decision to let myself go! I have never been out of shape in my life, so this is all very new to me. It was born of medical problems that started about three years ago. I know I promised to spare you the details, so just for better understanding, I will give you the “Readers Digest” version of my circumstances. For reasons and stories too lengthily (and quite frankly too boring) to mention, I was left with dangerous blood clots (one nine inches long in my carotid artery) rendering me no longer able to exercise for fear of moving the clot (or a piece of clot) into my brain or heart. It took two years to get through that mess and then I found myself with severe nerve damage and crippling bone pain. The nerve damage is irreversible (and being treated) and the bone pain is still being examined. In any case, left unable to move about freely, I found that I had started to reward myself with food. I can’t drink, don’t smoke and won’t do drugs, in my weakened condition I could no longer enjoy my daily workout at the gym, so I freely ate all of the foods and treats that I wanted. After all, at the very least didn’t I deserve this simple indulgence? Well here I am now, three years later with a belly for the first time in my life and a closet full of clothes that no longer fit! Well as of October first, I have taken the bull by the horns and I am determined to get back into shape. I am not looking to get back to the prime shape I was in before with a mere 9% body fat (although, if it happens I won’t be disappointed) but I do want to lose the stomach, drop the excess weight and firm up my torso again. I am sure that it will not only make me look better but it will make me feel a lot better too. If you’re in a similar situation to me and you want to join me in my quest for fitness, I will be updating my progress weekly on this blog and you are welcome to keep me posted on yours. We can share tricks, exercises and even healthy food options together! A Day without Drama is Like a Day without Sunshine! Aside from the obvious loss of a loved one, there is nothing that can get your heart racing faster than reaching for your wallet only to find it missing! Yesterday afternoon, we went to visit a family member in the hospital. After our visit, James and I decided to have an early dinner. We went to one of those famous Florida buffets houses where I was quite pleased with my “healthy choices” (which will be discussed in tomorrow’s Blog) when we had the great idea to purchase a to-go order to run it up to the hospital, where James’ dad was quickly losing weight from the world’s worst food. If you can believe it, even the roll that came with his lunch was uneatable. James had been doing the driving but when we reach the hospital to drop off the food, we switched places. I sat behind the wheel while he quickly ran the food upstairs. I was wearing a new pair of jeans from Rocawear and I had joked earlier in the day that someone should call Jay-Z and let him know that the lower back pockets may look cool, but makes it virtually impossible to sit when your wallet is in your back pocket. So I was reduced to holding my wallet all day. Earlier today while I was out running errands, I received a frantic call from James. It seems that he could not find his wallet anywhere and he had turned the house upside-down looking. I tried to calm him down while I looked in the car. James is infamous for leaving his wallet in the side pocket of the driver’s door or in the bin between the seats. He swore that he had never put it there yesterday and my search yielded no result. Then it occurred to me that he had stored his wallet in the carrying case of his laptop. He had placed that bag in the trunk. Could it be that his wallet had fallen out of the case and into the trunk? It was certainly worth a look. Sure enough, his wallet was there. Even over the cell phone, I could hear him breathe a sigh of relief. I headed straight home to bring him his wallet. Then quite suddenly, something told me to check my back pocket for my wallet. Much to my horror, it was also missing. I tried not to panic and told myself that I must have left it on my desk. Well I guess it goes without saying that it was not there when I got home. Now here we were in panic mode number two! Together we checked every nook and cranny in the house. I emptied the garbage can in both the kitchen and the big one in the garage. Finally I called the restaurant that we ate at yesterday, the last place that I had used my wallet. An angry foreign voice on the other end of the line simply yelled back “No!” and slammed the phone down. I rang up the hospital and was connected with Lost & Found. They had not received a wallet. Then I was connected with security who also said that no wallet was turned in to them either. They were going to check all departments in the hospital and get back to me. In the meantime, I went on-line to trace the use of all the cards I had in the missing wallet. So far so good, no charges were made. Could it be that it was turned in to someone at the hospital who didn’t get to the lost and Found just yet? Maybe whoever found it was trying to locate me? Finally the phone rang. Our search was now approaching three hours and I was anxious to know if it were found or if I had to do some fast banking management. It was the head of security for the hospital on the line. I was told that their search produced no wallet. They even checked trash cans in the event that whoever found it, might have taken the cash and junked the wallet and the cards. I was advised to call up my bank, the credit card companies, etc. and cancel all my cards. I could use my passport to get new ID. Before I placed the call, James asked if I had checked every place that it could possibly be. I confirmed that I did and even checked places that I knew it couldn’t truly be! I told him that I even checked all my shoes, just in case it had accidently fallen and landed in a shoe. It seems that last night after dropping off the food, when he stepped into the car, he took his shoes off. He noticed my wallet on the floor of the car and tucked it into his shoe for safe keeping so it would not get left in the car. However when we reached our house, he opted to stay barefoot and carried his shoes inside. Forgetting that the wallet was there, he simply put his shoes away. Due to the first missing wallet panic, the events of yesterday had understandably slipped his mind. I couldn’t have cared any less, how the wallet wound up in his shoe. The only thing that mattered was that it was not lost or stolen. We had a good laugh over it (after my blood pressure returned to normal) and I am happy to say, that all is calm here in West Palm Beach once more. Is There Any Feeling Worse Than A Missing Wallet? After the long, simmering summer we’ve all suffered through, it’s hard to believe that autumn has officially arrived (as of last week) and we have entered the month of October. I’ve always loved the autumn. It was/is my favorite season, ushering in crisper, bluer skies, the fragrant tannic aroma in the air and of course, the burst of colorful foliage. As a child in Bayside, I remember taking my three younger sisters on excursions to the woods of Ally Pond Park to witness the wonder of the vibrant explosion of leaves. Walking among the fallen foliage, the girls would collect the “prettiest” leaves to bring home to our mom. I always had an affinity for autumn and I remember one year in particular when I planned our annual family portrait around the beauty of the season. I picked a Saturday morning in mid-October to insure that the tress would be a glow with hues of yellow, orange and red. My idea was to have us all dressed in casual sweaters and jeans and have the photographer take photos of us as we raked the leaves and played together as a family. I purchased extra rakes, a bunch of natural bushel baskets and mom already had large pumpkins displayed on our front lawn. Everything was set… or so I thought. You can imagine my horror when I stepped outside to see that the landscaper had come through early that morning and stripped our yard bare of all foliage! Instead of an autumnal blanket of colorful leaves our lawn was a freshly mowed patch of green grass. The photographer was on his way and I had to think fast. I gave my sisters and a few neighborhood kids’ large trash bags and told them to quickly fill them up with leaves from the neighbors’ lawns. As you can imagine, our neighbors had no qualms about having less leaves of their own to rake up and in no time, we were empting thousands of multi-colored maple and oak leaves from the sacks to scatter all over our front lawn. We finished just as the photographer pulled up. 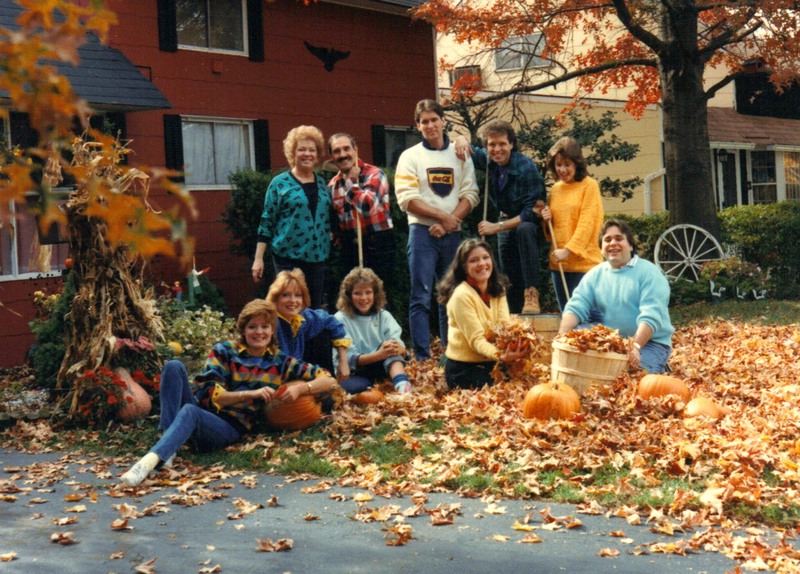 To this very day, that autumn photo is one of our most treasured family portraits. I hope that October ushers in a host of wonderful memories for you and your family.